A screenshot shows the notification email from AirAsia. KUCHING: AirAsia has confirmed it will suspend its non-stop service between Kuching and Shenzhen, China effective Feb 28. After much speculation, the airline confirmed the route would be discontinued due to ‘commercial reasons’. In an emailed statement, AirAsia said affected guests would be notified via email and SMS. “AirAsia strongly encourages all guests to update their contact details at airasia.com to ensure that they are contactable for further assistance. “Guests may also reach out to our Customer Happiness team via our contact channels listed on support.airasia.com to provide new flight details (new route, date and time) and passenger name(s),” said the statement. The inaugural AirAsia Shenzhen flight to Kuching touched down on Dec 27, 2017 to much fanfare. According to media reports at the time, the international flight was part of AirAsia’s plans to improve international connectivity to Sarawak, in line with the Sarawak government’s efforts to boost the tourism industry and flight connections. 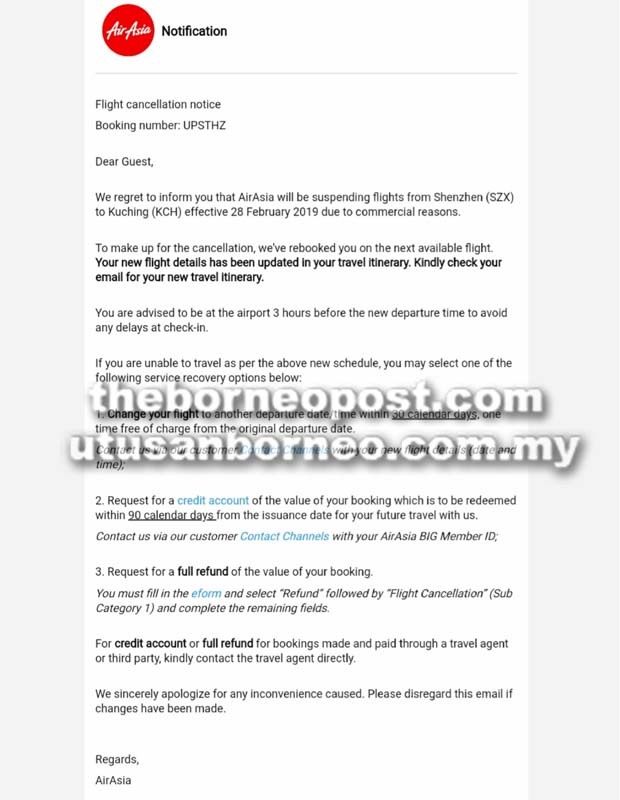 An affected traveller alerted The Borneo Post about the flight’s cancelation after receiving an email from AirAsia. The traveller, who only wished to be identified as Tommy, had booked to travel to Shenzhen in March. AirAsia informed Tommy that he will now have to transit in Kuala Lumpur before flying to Shenzhen. He is considering cancelling the booking for a refund. In the statement, AirAsia said guests who hold bookings with travel dates after Feb 28, 2019 are entitled to several service recovery options such as move flight, where they can change their flight to another departure date/time within 30 calendar days for free once from the original departure date. The other option is credit account, which is to retain the value of the fare in a credit account for future travel with AirAsia, with the credit to be redeemed within 90 calendar days from the date of credit issue. Another option is a full refund in the amount equivalent to their booking and in the form of the original payment via the e-Form available on Customer Support. To do this, the affected traveller must click on the ‘Email Us’ tab, select Refund under Type of Feedback, select Flight Cancellation under Sub Category 1, type in the subject ‘KCH-SZX Refund’, complete the remaining form fields, and click Submit to proceed. For credit account or full refund for bookings made and paid through a travel agent or third party, AirAsia advised the affected passengers to contact the agent directly. When contacted, Tourism, Arts, Culture, Youth and Sports Minister Datuk Abdul Karim Rahman Hamzah reserved his comments on the impact of the cancellation and its possible causes. “I am still overseas. I will entertain this once I have the details,” he said.